Often referred to as a pond by cyclists that have been ridden around it many times, Lake Taupo is New Zealand’s largest lake with a surface area of 616 square kilometres. I have previously ridden around ‘the pond’ four times, one lap in each of the past four years. 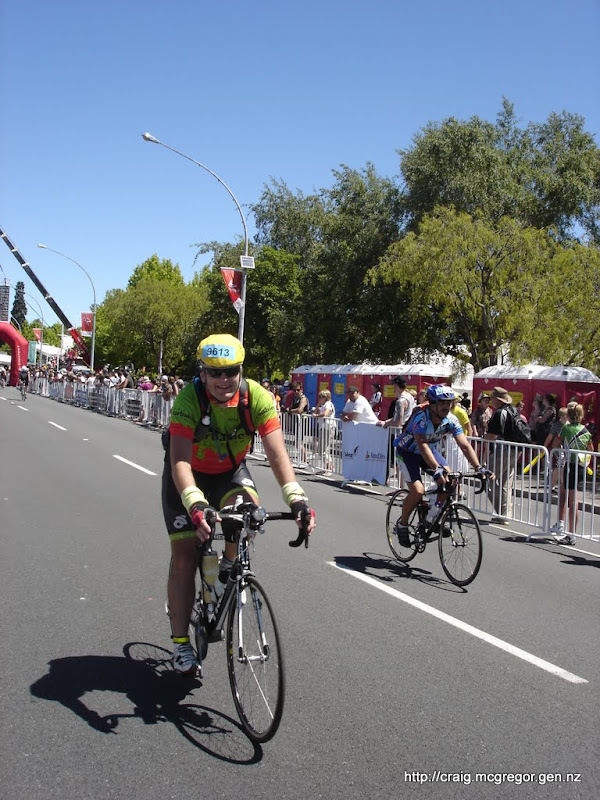 For me, the 2010 Lake Taupo Cycle Challenge featured a stolen bicycle, a brand new Trek and two enjoyable laps of ‘the pond’. It was a disrupted lead in after my Specialized Roubaix Expert was stolen just 12 days prior to the event. Thankfully AMI resolved the case promptly, albeit at second-hand value and not replacement value of the bicycle. Capital Cycles gladly accepted my “emergency visa” to top up the insurance and had me going on a new Trek Madone 5.2 quickly. They were also kind enough to loan me the factory wheels while they built some strong and durable Mavic Open Pro’s with a full compliment of spokes and Dura-Ace hubs. I was lucky to work like this done at the last minute immediately before the Lake Taupo Cycle Challenge, New Zealand’s largest cycling event. These wheels are more suited to my sturdy frame and the ultra-distance endurance cycling goals I have over the next twelve months. Capital Cycles finished building the wheels on Thursday morning, so I only had a chance for 10km commute home before travelling up to Taupo the following morning. On Thursday evening I tried to swap the light and fast but not particularly puncture proof Bontrager tyres that came with the bike. Will be handy tyres next time I ride a shorter race or perhaps a criterium. Unfortunately, while I am usually able to change tyres without the use of tyre levers, this tyre and rim combination was simply too tight for my bare hands. With my tyre levers still in the toolbag on my stolen bicycle, the best of intentions to be prepared in advance came to nothing and I was buying tyre levers at the event hours before my 1:30am start. With a stiffer frame on the new Trek compared to the stolen Specialized I opted for 25C instead the “standard” 23C tyres. This allowed me to run the tyres at lower pressure without risking a pinch flat. 95-100 PSI both feels better over chipseal and offers lower rolling resistance than at 115-120 PSI I usually run at with 23C tyres. With the chip-sealed roads in New Zealand I am surprised the use of wider tyres for the many of us over 90kg is not standard practice. You may wish to read the excellent article "Tyre Pressure and Load by Jan Heine” which appeared in Adventure Cyclist in March 2009. Thinner tyres are not always faster. My replacement Ayup headlamp mounts had not arrived from Australia before I left Wellington (In hindsight they had arrived just seven minutes after I left!). Thankfully my work colleague Phil was able to loan me a mount to use, which I fitted when he arrived at the cabin next door. I matched the Ayup light with a Cateye HL-EL530 headlamp to meet the dual lighting requirements for Audax rides. It also gave me a combination of a rechargable system with long battery life, and an backup system that could run off off-the-shelf batteries. Both have a good run times and are bright enough to be used alone for night-time road riding. The EL530 has a small concentrated bright spot, with plenty of less lit, but acceptably right area around it.to see all you need. The Ayup lights are smaller, yet brighter and offering a far broader and consistent coverage area. The Ayup system offers better lighting, but the EL530 runs on four easily purchasable AA batteries. With the bicycle complete, I had enough time for about two hours sleep before it was time to get up and head down to the 1:30am start. Tiredness was not a problem for me when I woke. I was excited to get out for a good long ride and see how my nice new Trek would perform. On arrival at Redoubt St, there was a lot of broken glass about but thankfully I did not hear any tyres puncture from it. I started near the back of a field of about eighty of riders. At 1:33am we were off. To my astonishment as we rode through the initial 16km of predominantly ascending to the highest point I was still holding comfortably in the main bunch. If you are a regular reader my web-log you will be aware that I am quite used to being dropped on climbs. Whether it was training, the enforced 12 day break or the new bicycle I was adamant my new Trek was a “Rocket Ship”’! The “Rocket Ship” verdict was confirmed through the night as I continued to stick with the bunch up, up, up and over Waihaha, Kuratau and Waihi Hills. I tried to jump the bunch to give myself time to get my brevet card signed at the Turangi Truck Stop. Ultimately, this effort was futile. Even a stop of just a few minutes, is a lot of time on the road. At 30km/h it was a matter of losing 500m per minute to the bunch. With no-one else stopping here I was obviously the only one in this bunch riding as a 300km Brevet to qualify for the Paris-Brest-Paris in August. The remaining ride through to Taupo was mostly in solitary, although there were a few moments with two other riders. Unfortunately were unable to find speeds that we were able to ride together at. Once through to the Caltex in Taupo in a handy 5h45m. I had a short break, getting my brevet card signed, putting on a clean shirt and swapping two empties for two more bottles of perpetuem. I put some sun block on too, but by the finish it was obvious that “some” was not even nearly enough! Thanks Mum and Dad for meeting me at the controls with my pre-made drink bottles and things. I passed through Taupo to start my second lap at about 7:30am and instantly was inundated with one lap riders with fresh legs riding straight past me. It was almost impossible to hold the bunches because someone with fresh legs would undoubtedly lead a new wave of attacks at the slightest sign of an incline. With one lap already in my legs I was feeling much more in the mood to ride in a consistent speed and effort zone than for following attacks and accelerations. The hills sure seemed harder during the second lap. Was it just from having more work in my legs? Had the darkness flattened them during the night? Does heat make them this much harder? The first 3/4 of the second lap was a procession of riders attacking each other and passing me. After the stopping at Turangi Truckstop for the second-time to get the third row of my brevet card signed there was a dramatic difference in the one lap riders I was riding with. With the stronger one-lappers well through now I was now leading packs, passing one-lappers with cramp or sleeping in any piece of shade they could find. This was surely the hottest day of the year? By Hatepe, I was cooking myself and a brief stop in the shade before riding up the hill past numerous other riders, some of whom needed to use the ‘two-foot’ gear. I am convinced that the key issue with Hatepe hill is not only that it occurs late in the ride, but that there is little shade, maximum sunshine and it can be stinking hot riding up here. At in 140km (or 300km) already ridden in the legs, and this non-mountainous hill suddenly feels like a wall. Once over Hatepe I focussed on efficiency, ensuring to keep my head down and arms narrow downhill ensuring good speed without needing to pedal. This gave me excellent recovery and I was back to full power on the pedals to cross the finish line in 12h42m looking fresh, strong and ready for another lap! More distance is certainly coming up. This ride counted as the 300km qualifier for the Paris-Brest-Paris. 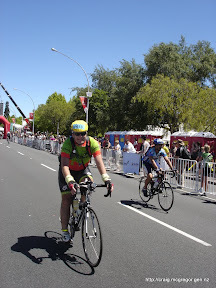 I now need to focus on the 400km and 600km qualifiers and then onto the 1200km epic in France in August 2011. The Tour de Manawatu has a couple of short steep climbs early on, on the way out of Ashhurst. After this there is a long but incredibly gradual climb and fall with one other lump before the finish back in Palmerston North after 116km. This sort of course would normally suit me, but today I was backing up from consecutive 200km epics with the GWALoop and the K2 from previous two weekends, and the Tour of the Bay the weekend before them.. This was weekend four from four and for me it was one of those days where if I had not entered in advance and paid an entry fee I may well of not turned up to ride and stayed home for a sleep in. I was managing to hold my own on the initial part of the climbs which denotes significant hill climbing improvement from the past. Unfortunately, I had a combination of four different riders either dropping their chains or getting punctures immediately in front of me on the way up the hill. The net effect of this was the same as my past hill climbing experience – losing touch with the bunch by the top. Ultimately this mattered little. I didn’t have a great deal of power in my legs today. Riding my fourth event in as many weeks was catching up with me so with tired legs I rode it out in generally solo riding through to the finish.